May I introduce myself? I was born in 1945 and brought up initially in Inner Street, ¼ mile from Grantham Railway Station. My first school was Spittlegate Infants, even closer and I was an avid train spotter from 1953 to 1961. I still retained a passing interest thereafter but for the eight-year period I was in my spotting prime. I am not sure which of my railway recollections comes first, but I suspect it was visiting the ‘Loco’ via the crossbar of my dad’s bike. To a young boy that array of engines spreading in front of the old north sheds was just mind blowing. The noise and steam of engines coming off shed and 'the angle' or shaping up for a northbound change are still etched in my mind over sixty years after the event. Did I really see A1 Sea Eagle on that first visit or was it later? Class A1 No. 60139 Sea Eagle prepares to depart from Grantham for the south in late June 1962. 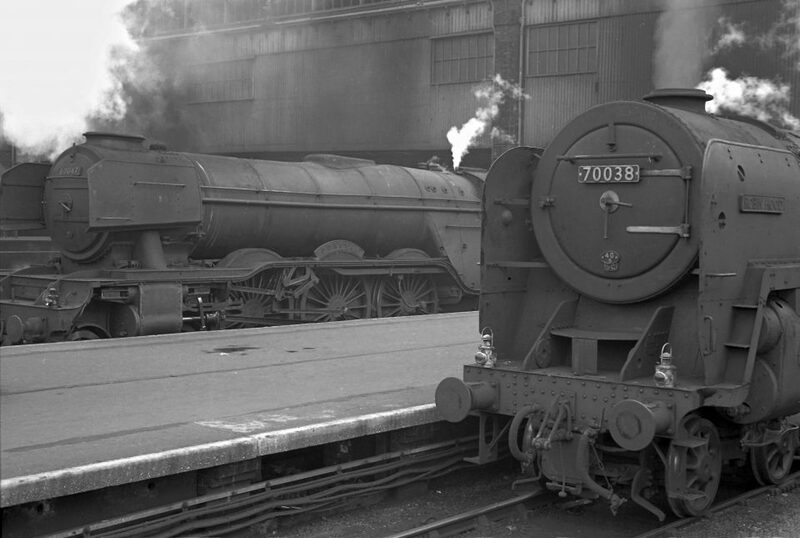 My train spotting career really began however, one June morning in 1953 just after the Coronation with a school trip to London and the nameplate Donovan [the locomotive on the left in the photo at the top of the page, taken at King's Cross in 1962]. The A3 came past the platform with our train and is clearly remembered still as is the name plate of the engine on our return – 60149 Amadis. My walk up the length of the platform to view this big green monster was the first of many such walks over the years. For a short while after the London trip I found that by peering over the wall at Spittlegate Infants School there was a narrow gap between the station and other buildings through which a slow moving engine could be spotted. You always remember the first! – easy – 60136 Alcazar coming by ready for an up engine change. It was not enough and I was introduced to South Parade Railway Bridge. South Parade was a mistake – the locomotives moving too quickly for an eight year old's eye. I seriously doubt whether 60079 Bayardo (a very rare 68C engine) and 61251 Oliver Bury (when a King's Cross engine) passed in the space of half an hour. Guilty conscience after 60 years I suppose, but I did see both later. This is important; the integrity of the spotter was paramount. After South Parade my next period of spotting was at the ‘Loco’. The ‘Loco’ was an all-action area even if it did have one major disadvantage – down main line stoppers blanked out incoming up trains – hence there was always a regular dash along the subway into Station Road. A sufferer of the blanking out was the up Elizabethan with the possibility of a not-to-be-missed Haymarket A4 – 60012 Commonwealth of Australia was my last. It is a long while since the Loco was closed to spotters and yet the memories are still there. Another Carlisle Canal shedded A3 60068 Sir Visto hanging around for a week or so before ultimately disappearing north on an evening freight originating in Grantham. This came from the south yard between the old shed and the station. This was an unusual occurrence, at least during daytime hours. A whole string of mainly Heaton shedded clean A1’s with exciting sounding names – Meg Merrilies, Hal o’ the Wynd, Madge Wildfire, Redgauntlet. The C12 shunters always busying themselves around the station and yard. And finally, an abiding memory of the long named V2 “The Snapper etc.” taking over a Newcastle passenger train at dusk with the fire lighting up the night sky. During this period my Granny and Granddad moved to Victoria Street, near the new shed. A regular walk to the loco and station was along the footpath between the allotments and 'the angle'. Three real surprises on the way still stick in the mind. One morning during the school holidays surprise surprise there was the only D49 ‘Hunt’ that I ever saw at Grantham, 62765 The Goathland, standing in front of the loco facing north, having presumably come in on the early morning Doncaster local. Amazing. A Sunday afternoon, on the way to Sunday School. From a distance a lamp post splitting an engine in two – to the right hand of the post a curved A3 name plate, to the left of the post what we spotters called “blinkers”. 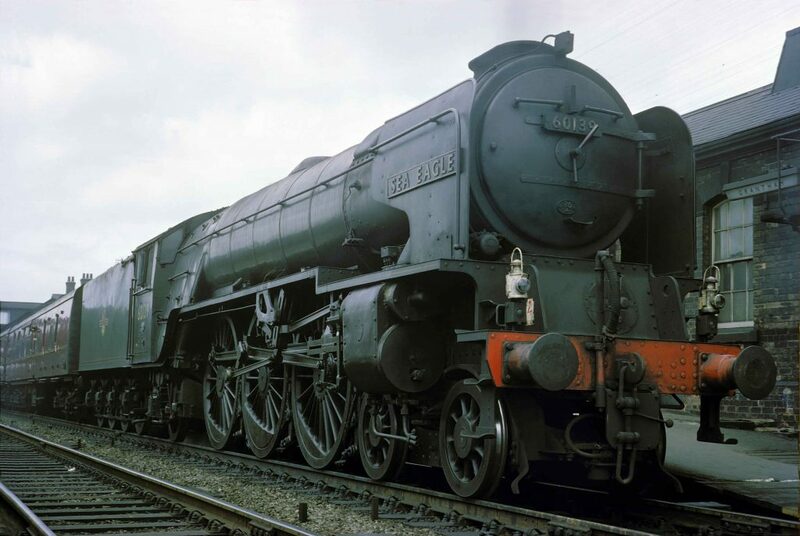 The guilty party was the only A3 so fitted at that time – 60097 Humorist. The only time that I ever saw this engine. Mr Parker, a friend of my granddad, was a top Grantham driver. He lived in Victoria Street and recognised this little blond haired kid walking alongside the angle sufficiently well to offer him a ride on his passing loco – A1 60128 Bongrace. I know where I ran over and got on – not far from the two main line pilots. Don’t ask me where I got off. I think I just floated in a dream over the fence on Springfield Road. With the closing of the Loco my next spotting location was the station itself along with lads from all over the East Midlands. A 1d platform ticket was all it took for maybe a couple of years. After a while we were all ejected during the day but locals were allowed back in the evening when it was much quieter. Well the first of many new 9Fs for a start. Funnily enough 9Fs did not appear at Grantham until well into their build. More in demand replacing older engines elsewhere I guess. One of my first non A4 Scottish Pacifics A2 60529 Pearl Diver, in sparkling ex-works condition drifting south on a south-bound freight. My first shot at photography with my uncle’s box Brownie and then my own Kodak 44A. I was not very good. The one A4 that I can clearly remember not cabbing on shed – 60009 Union of South Africa. This headed the early evening “Donny” local into platform 1 on one never to be forgotten occasion and the driver invited me on board. To a young spotter on his own this was heaven. The most memorable engine ride was one summer’s evening when all the spotters from the Nottingham and Leicester areas had gone home. B1 61033 Dibatag came in on a Nottingham train. The driver, taking pity on a lonely local, not only gave me a trip round the 'angle but also under the coaling stage and finally back onto the carriages before the return trip. A once in a lifetime experience. Once the station itself was off limits, and having ruled out the Harlaxton Road bridge due to horrible sightlines, the locals now chose Springfield Road. A good view of all lines, handy for the new shed and a quick cycle ride for engines turning on the angle. Just as girls and Nottingham Forest came along, this was my second home. A Britannia Pacific 70041 Sir John Moore, B1 namers Orebi and Waterbuck and 'Sandys' on the dead line next to the shed are my only clear memories of Springfield Road, apart from one absolute highlight – Neville Hill (50B) engines were rare at Grantham, presumably working the Leeds-Newcastle run. I presume that Copley Hill borrowed them occasionally and A3 60074 Harvester surprised us all one evening with an up passenger train. The cheering ended with one spotting book disappearing over the timber fence behind us. This sticks in the memory because a policeman happened to pass by just as the retriever came back over the fence!!! My move from Grantham to work, originally as a trainee quarry manager at Ketton Cement near Stamford, coincided with the running down of steam at Grantham and these spotting memories. I always thought that it was a pity the move was not a few years earlier when I could have been learning on steam engines rather than Ketton’s Fowler diesels. These are superb memories from a bygone age. Thanks for the nice comment Peter. One of the few regrets in my life is not keeping my spotting notes and photos. I guess my mum just got fed up with them hanging around. I did keep my last Combined Volume and this plus never to be forgotten memories helped me write the article. Great days at Grantham station. I can remember going on the train from Nottingham Victoria, always got the first train so to be in time for the morning rush from London and the North, watching all the A1s A2s A3s and A4s going past at speed, stayed all day, got the last train back always. I can remember also going in to tea room and purchasing a hot pudding - great on those cold winter days as I only had a homemade sandwich and a small bottle of Tizer to last all day, but it did not matter - it was great fun. Thanks for the memories Colin. Your pudding reminded me of my love, when train spotting away, of Lyons Fruit Pies!!! !